Most “horse games” I’ve encountered are very concerned with being about horses, but sadly unconcerned with being good games and having functioning, motivating and interesting game mechanics. I am convinced that putting the focus on horses as a theme and setting and making a solid, well-executed game are not mutually exclusive. Or at least, they shouldn’t be. And while I would do many things for a good stable management game, that is far from the only genre in which a good horse game could be made. In fact, as soon as I started making an actual list, I quickly realized that there are too many such ideas to fit them in one post, which is why this is only “Volume I”. Stardew Valley is a wonderful game, but the horse in it may as well be a bicycle for its mechanical complexity. Let’s get the obvious one out of the way: there should be a good stable management game. Something cozy and cute in the vein of Harvest Moon, Stardew Valley and My Time at Portia, but with a core game loop focused on horses rather than farming or crafting. To make for solid core mechanics, there could be a variety of ways to earn money with your horses such as giving riding lessons, winning shows and competitions and breeding and selling foals. In turn, money could be spent on things like food and equipment, new horses and upgrades to your stables and its surroundings. This should all be neatly tied together by a cozy little story that involves the inhabitants of the nearby village and propably some rivalling stable. So many games have been made in this genre, but barely any that were made with enough care to keep a player busy for more than a few hours. And even if there have been one or two passable games in the genre in the 00s, it’s high time someone brought the stable management genre up to 2019 standard. In case you missed it: I’m trying to do just that, but it’s slow going, and I double dare anyone to make a game like this faster than I can, because I’d love to play it. 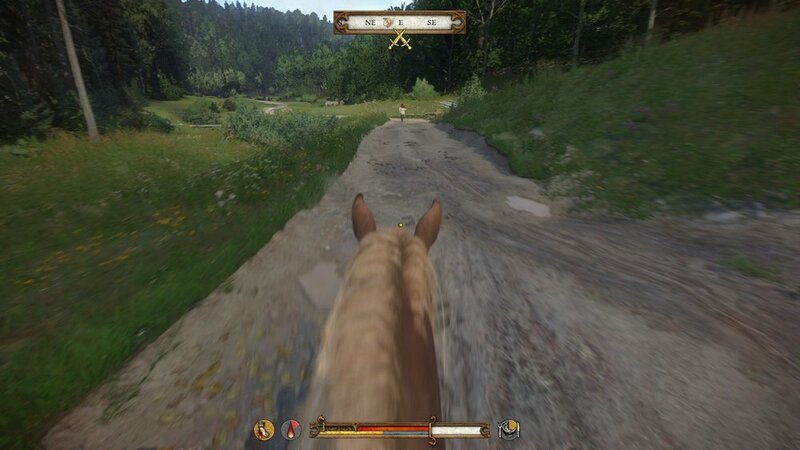 Kingdom Come: Deliverance is one of many games to feature horse riding for transport, but without any attempt at realistic input. There is a subgenre of detailed, realistic simulators where players take control of airplanes, trucks or trains, with real machines being reproduced in minute detail. I don’t believe that horse riding is really a more niche activity than piloting a plane, driving a transport truck or conducting a train, and yet no equivalent “Horse Riding Simulator” exists. Horse riding can be a lot more complex than many laypeople give it credit for: What may just look like “sitting” is actually a complicated interplay of different inputs. Rider use various aids - leg position, leg pressure, seat and weight distribution, reins and voice commands - to control a horse. Between a skilled rider and a well trained horse, these motions are fine enough that it looks like no effort at all to the unknowing outside observer. I don’t think a video game can represent this with perfect realism, but there is definitely untapped potential: A Horse Riding Simulator could let the player control a rider’s limbs individually, giving input with right and legs and reins separately. Players without riding experience may be surprised to learn how many inputs go into basic dressage exercises, which could make for challenging gameplay. The trick in designing such a game would be the balance between realism and fun, making basic horse riding difficult but not frustrating. A game like this could be all about the training ring, or could feature exploration and riding through the countryside. Such a Horse Riding Simulator may also be a good fit for Virtual Reality where rein aids could be applied using motion controllers. Whether or not there is a way to implement horse riding in VR without the player getting motion sick is a question I don’t yet know the answer to, but I have found someone who is giving this sort of thing a try, and you might want to follow her on twitter. Alternatively, the gradual input of left and right triggers on a regular gamepad might be used for reins, with the analogue joysticks for legs? A “realistic” mapping of horse riding inputs on a standard Xbox or PlayStation controller sounds like a game design challenge I’d love to play around with. 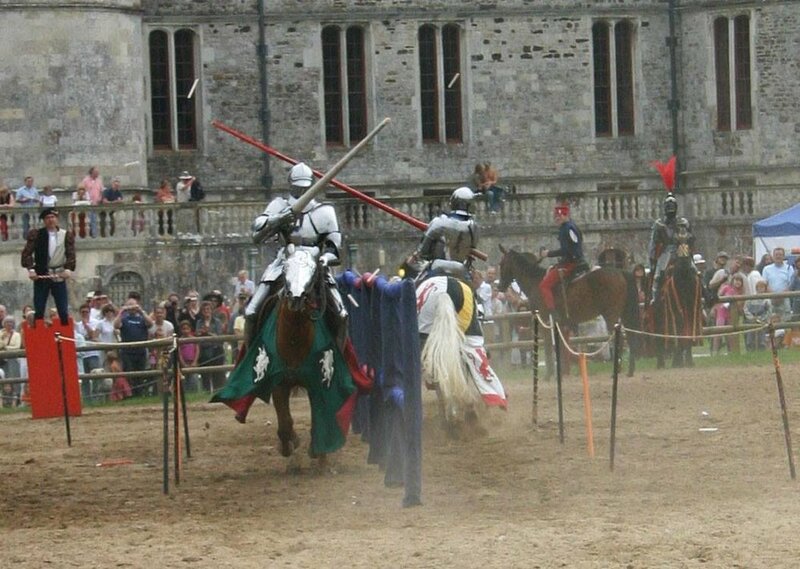 Any game about Knighthood should probably feature some jousting tournaments. A game where you play as a knight may not look particularly revolutionary at first glance, seeing as how armored sword fighters are a staple of many historical and fantasy games. But here’s the thing: Going to war was historically far from the only interesting thing a knight had to do, and it’s about time those other aspects get some attention too. Kingsley demonstrating some medieval chores in armor. I’ll come out and admit that this idea was inspired by watching a few episodes of Modern History TV on YouTube, which I discovered during research for my interview with medieval horse trainer, historian and gamedev Jason Kingsley. In the show, Kingsley explains and shows various aspects of knightly life, and many of those would work as game mechanics. You could have to ride through your lands and take care of your people, perhaps acting as a mitigator of conflict. You’d have to manage your estate, hire and command your squires and other “employees”. And of course, you would train your horse for war by desensitizing and acclimating them to the noise and sights of battle and by training and collecting the steeds for complex mounted maneuvers as they are demonstrated here. Black Beauty in the 1994 film adaptation. In case anyone is somehow not familiar with it: Black Beauty is a novel told from the perspective of a horse. When it came out in the 1870s, it was actually sort of revolutionary to acknowledge that a cab horse might have such a thing as feelings, that it might miss the open fields of the countryside or the contact with other horses or be in pain when subjected to inhumane tacking practices. Victorian England carriage aesthetics from The Order 1886. The neat thing about the book being almost 150 years old is that the rights to its characters have passed into public domain and anyone who felt like it could make a game about Black Beauty. How this idea would work mechanically is a bit more difficult to figure out since Black Beauty’s story is very episodic in nature and his tasks and struggles are different from each part of the story to the next, from horsing around on a country farm to struggling as a carriage horse. Gamifying this particular story would be made harder by the fact that Black Beauty tends to be a rather passive protagonist, subject to the whims of his various owners. While tying the story together with game mechanics that make sense is quite a design challenge, the advantage of making a Black Beauty game would of course be that most horse fans are already invested in and familiar with the character, which could make it easier to garner interest for the project. A beautiful 3D adventure game on this subject would be amazing, but perhaps a simplified sidescroller with neat pixel art would work too? With narrative and emotion, it all comes down to music and heart anyway, rather than to graphical fidelity. Games like Undertale and To The Moon are proof enough of that. Shadow of the Colossus has a wonderful horse companion, but much of the gameplay is focused on combat. For many people, working and living with horses is not really about skill or success, but about companionship. There have been a handful of games that featured this sort of relationship between rider and horse - Shadow of the Colossus comes to mind - but not many where taking care of your horse along the way is a core mechanic. Imagine a roadtrip on horseback, a journey where human NPC interaction is rare and your mount is your partner, companion and means of transport. Tasks and puzzles along the way could challenge you by finding food and water for your horse and yourself, perhaps by choosing between a quicker paths that will let you reach shelter in time before a storm or a slower one that poses a smaller risk to your horse’s condition. Alternatively, the game could present the player with one puzzle after another, much like FAR: Lone Sails does with a vehicle rather than a living mount. The only game I can think of that has actually tried putting travel with a horse in its focus is Fable: The Journey, which made the player steer a carriage using the Xbox Kinect’s motion control. A big challenge in making a horse-based adventure would lie in ensuring the player’s attachment to the companion. Designing for empathy and care requires sound, models, motion and interaction to harmonize. The concept relies on immersion, and any small glitches can quickly break the player’s suspension of disbelief, or even result in the player being annoyed at the horse’s needs instead. Fable: The Journey actually put travel with a horse in its focus, but received mixed reviews for its motion controls. While the idea is where it all begins, it’s a common opinion that having an idea is by far the easiest part of making a game. Ideas can be cool or original, but they have little inherent value. Two dev teams who work with the same basic idea will end up with two entirely different games in the end due to differences in execution, implementation and actual game design, let alone art and sound and marketing. As such: please steal these ideas. Take them, modify them, implement them and tell me about how you’re doing it so that I can point TMQ’s readers to your dev blogs and your crowdfunding campaigns. Many horse game fans are starved for good content and will support you if you deliver what they’ve been looking for. Which of these games would you be most interested in playing? What is missing from the list?